There are so many ways for companies to report different earnings on their Annual and Quarterly Reports than what is actually physically in the bank. Generally Accepted Accounting Procedures (GAAP) is the standard framework of guidelines for financial accounting used in the United States. GAAP includes the standards, conventions, and rules accountants must follow by law when preparing financial statements for investors and other stakeholders. The problem with these accounting standards is that they measure bookkeeping entries and not actual money in the company’s bank account. Because of this (while a relatively simple answer to a complex question), investors must be cautious when using financial reports as the sole basis of investment in a company. We must dig deeper than just the financial accounting that appears in companies’ financial reports. Even though hindsight is definitely 20/20, we all should have seen the problems coming in the housing market. Home prices, or the price of anything for that matter, cannot go up forever. We cannot continue to flip homes in a matter of weeks let alone days before the ink is dry on our originally closing documents. We should have seen that nothing good could come out of no income verification home loans. Charlie Munger says that a lot of times we see the writing on the wall about bad investments and bad ideas, but a lot of times we just do not want to recognize the reality that is staring us in the face because it is not as rosy as we would like. I love this quote because everyone seems to be preoccupied with new worries of impending inflation. I can remember my mother complaining about the price of movies that we have to pay now when we going to the movie theater. She used to tell me that she would receive a dollar bill in the 1960’s from my grandfather and that would cover her ticket, popcorn, candy, and a Coke. Now, you have to drop $40 on a date if you go to the movies. But, has the world just gone off the deep end because of inflation? No. It is a normal function of a healthy economy. In the example above, $1 movie in 1953 that costs $20 in 2009 dollars would require an inflation rate of 5.5% which is only slightly above the annual average for the CPI during that time of 3.8%. Another interesting example…lets say the average 22 year-old graduates from college and earns $30,000 per year. He could expect to earn $150,000 per year when he retires at age 65 thanks to an average annual inflation rate 3.8% (all other things constant). Who Is Charlie Munger? Almost anyone who fancies themselves an investor of finance junkie knows about the Oracle of Omaha, Warren Buffett, who is the Chairman and CEO of Berkshire Hathaway. But, a lot of people do not know that he has a sidekick and longtime partner in the company’s Vice Chairman, Charles Munger. 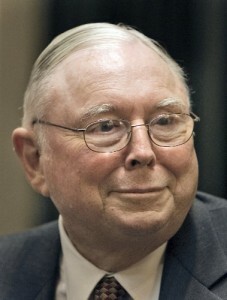 Charlie Munger is a billionaire, who is Buffet’s right-hand man, and is considered one of the world’s savviest investors. He is someone who has helped guide Buffet’s portfolio picks since 1959. He is without a doubt Warren Buffett’s right hand man. There are two reasons old people are sleepy-eyed. One reason is that they are sleepy. The sooner you figure out the second, the better off you will be. Firstly I feel one should base on technicals then financials. Technicals are the ultimate. Secondly Time is a very big factor, holding a stock for too long not only prooves wrong selection but emmotional attachment also which is not required in any business.